Have we really been here for 5 weeks?! To say that time has flown by would be an understatement. We have learned so much and cannot wait to share more stories once we get back to the States. Our usual weekday schedule hasn’t changed since we last updated. Monday through Friday usually revolves around lesson planning and teaching though we all agree that we are trying to focus more on just creating relationships with people instead of just teaching. I have definitely grown so much more comfortable with teaching; I’m not longer really shy in front of my students. We laugh a lot; especially when I misspell words (I constantly have to remind them that I am not a dictionary and don’t actually know everything). The students and leaders continue to shower us with love and kindness; I personally have never felt so cared about. I am already starting to mentally prepare myself for the fact that I will have to say goodbye to everyone in a few shorts weeks. Besides teaching, on the weekends we do our best to see as much of the city as we possibly can. We’ve hit most of the major tourist spots but also feel so lucky that we have been able to embrace the not so touristy part of Cambodia as well. Meghann and I got to explore the Royal Palace which is simply beautiful. A couple times a week we go to the local market to get food and delicious smoothies, $1.25 for a plate of food! I’m going to miss how cheap everything is here. Saturdays are also Club Nights. This past week Katie did a song and dance at her club which hopefully we’ll all be able to see soon. Meghann and I stayed at Center 1 for club which was movie club. We watched a Thai movie, didn’t understand a single thing but it was so nice to hear that they appreciated us staying. 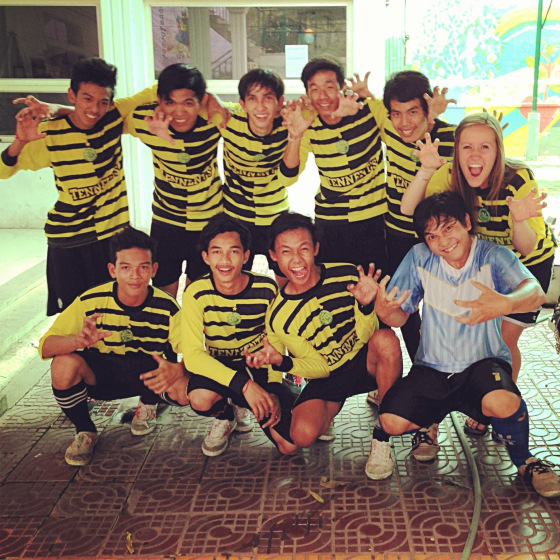 On Sunday, we went to the ‘Futsal’ Final (Aka indoor soccer) and had a total blast! There was a celebration after and one of the teams from my center for second place in the overall bracket which was really exciting. During the celebration they gave out prizes, sang songs, played games and just spent time together. God continues to work in all of us as he shows what we each need to work on or learn to love about ourselves. These past two weeks I have been reading a book called Captivating and it has had an incredible impact on my life. I suggest that every single woman reads this and guys, if you want a little more insight on how women work, I would suggest your take a look as well. Please pray for our health. The national elections are this Sunday and I ask that everyone prays for the right party to be elected and for safety as things may or may not get a little violent. We are also traveling next weekend to Angkor Wat, so pray for safe travels. Meghann and I are going to an island on our last days here, so safety for that trip as well! All in all, we continue to be so grateful for all the prayers and support from everyone back home. Our team has had a crazy, exhausting, wonderful and rewarding experience in the past couple weeks. We can’t believe that it’s already been almost 3 weeks! Time has completely flown by. We officially started teaching our English classes last Monday (the 1st of July), Meghann teaches at Center 1, Katie teaches at Center 3 and I teach at Center 2. Katie and I also teach 2 days each at Center 2A. We spend multiple hours a day making lesson plans; we all definitely appreciate our past teachers so much more because turns out, teaching is a lot harder than it may sound. Although there are challenges, the students we teach make up for it. These kids have already had such a huge impact on our lives and I know that although we’re here to teach them English, they are teaching us a lot about God and life in general. Meghann and I regularly go to a tea place called Tea & Talk where they have THE MOST DELICIOUS iced green tea lattes for $1!!! We are also frequent visitors at Aquarius Café since it’s only a 2 minute walk from our house and has delicious coffee and desserts! The one thing I also have to mention is how much I’ve learned about God. Sometimes it takes one getting completely out of their comfort zone to see how incredible he really is. I’ve realized that I’ve taken so many things for granted, God’s faithfulness is one. The past couple of weeks I have seen him work in others and also myself, and that is truly amazing. I’ve met so many people with such amazing faith that mine has been increased in amounts I wouldn’t have thought possible. I’ve realized that I on my own am completely weak and inadequate for the work I want to do, but that with God, anything is possible. All in all, things are going well here! We are so grateful for the support and prayers we’ve been receiving and ask that you continue to pray for us. 2) Attended a Khmer church called New Life. Worshipping in English while they sang in Khmer was such a surreal moment. I felt God present even when I had no idea what they were saying, I never thought that would happen. We’ve encountered so many kids who are the only ones in their family that know Jesus yet their faith is so incredibly strong. I am truly humbled and inspired. 3) We danced K-Pop in the middle of their main park. Katie is a great dancer and fit right in, Meghann and I on the other hand were not so good. However, the people around us got some good laughs and that’s all that matters! 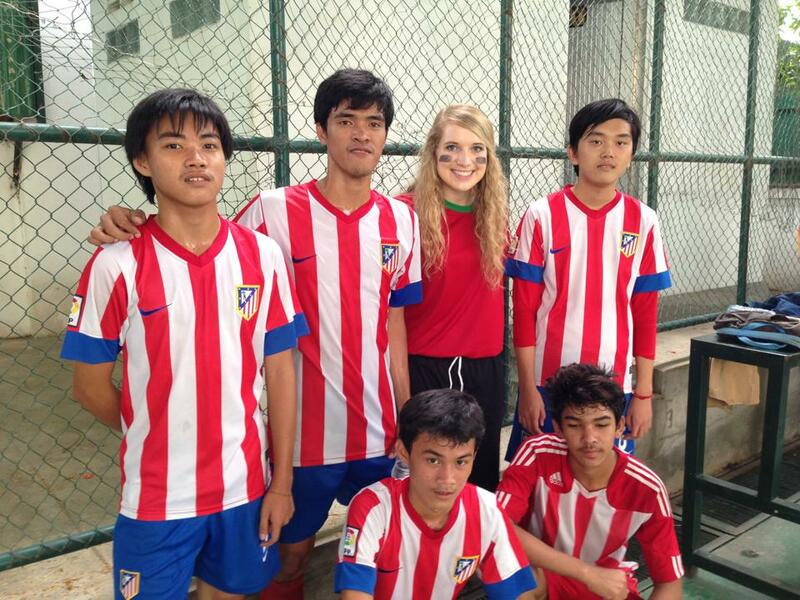 4) Every Sunday the boys play soccer. And no it’s not just pick up games. They have jerseys with their names on them, there’s a referee, a scoreboard and standings. It’s amazing to see how it’s different from US soccer, no one faked injuries and they are nice to each other even when on opposing teams. I can’t wait to cheer my center on next week! 5) We eat… a lot. I swear they want to fatten us up because whenever we go anywhere they are always trying to get us to eat. Now I’m not usually one to complain (plus the food here is delicious) but there comes a point where I physically cannot eat anymore. Oh and the coffee here tops any coffee I’ve had in Seattle… I didn’t think that’d be possible! We eat a lot of mangos and other fruits picked right from the trees in our backyard, YUM! 6) Khmer cheese isn’t cheese… it’s old, aged fish…. We officially start teaching our classes on Monday so prayers are greatly appreciated! That is how one would write “hello” in Khmer, the language they speak in Cambodia. To say the past couple months have flown by would be an understatement. It seems like it was just yesterday I got talked into filling out the Deputation Application, and now looking back I am beyond glad that I did. I’ve always dreamed of going on a mission trip, but this isn’t exactly how I was planning on doing it. Being the anxious-planning-obsessed person that I am, giving up the option of deciding where I would spend my summer was terrifying. However, I’ve realized that this is exactly what I should be doing and I can speak for the team and say that we’re all excited to get started! In Cambodia, we will be living at the main Young Life center in the capital city of Phnom Penh. I personally am excited to be living in the city and can’t wait to see what it has to offer. The job that we will be doing is teaching conversational English to high school aged students, however there is a catch. All three of us will be at different centers, with our own classroom, making our own curriculum … oh and none of us have ever done anything like this before! I guess that’s why I’m calling this an adventure! We will also have time to just hang out with the kids, get to know them and their families and do our best to show them the love of God. On weekends we will be also helping out with the Young Life clubs, I am praying that God utilizes us to share the word with everyone at those clubs! I am excited to experience a completely different country, culture and even the food. However, more than that I am excited to see where my relationship with God will go. I know that this will be a time where I will have to rely on him because I honestly don’t really know what I’m doing. I hope to grow in faith and love for others. The Kingdom of Cambodia Awaits! This is the Royal Palace in the capital of Cambodia, Phnom Penh. We have about 2 more days until departure! I will start with the fact that we all love it here, not to say that has been easy, but even dealing with what has been hard has been a blessing and an opportunity to learn. As time goes flying by we have been growing together as a team and learning to walk closer to God as we learn what it means to serve by watching the people we are here to serve. Their genuine interest and love for each other and us is evident in the simple things they do, such as remembering, from the first week we were here, which worship song Brittany mentioned that she likes, and then playing it during devotions. Or locking me (Carly) in a room, literally I couldn’t escape, and making me take a nap after tucking me in with a towel and positioning pillows around me for maximum comfort. And holding our hands when we walk across the six lanes of traffic because it is terrifying. And sweeping the floor and setting up a bed for Lael when she shows the smallest sign of being tired, and physically dragging us away from doing our dishes because they want to do them for us. Everyday we are left in awe of the love that radiates off the people we get to work with and the true likeness to Christ that they show. Their genuine compassion and grace for each other is pulling us closer and closer to Christ. They are teaching us to be servants, everyday, not because anyone deserves to be served but because that is the example Christ gave to us. We love them!!! We are still uncertain what exactly our purpose here is, and teaching has not come easily to all of us, but we are learning to focus less on trying be excellent teachers and more on making connections with our students and the Young Life student leaders that hang around the centers all day. We are trying to “earn the right to be heard” by meeting the students where they are and building relationships before we ever bring up God, even though that is all we want to do! We all get called “Teacher” in soft Cambodian accents and now have papers to grade and lessons to plan, just like real teachers!! Lael has been able to start building a good relationship with four of her students and is hoping that through that she will be able to earn the right to be heard. She has been actively involved with contact work by helping a student make a Facebook, learning to enjoy Korean music videos, and going to a student’s house for coffee. She is also looking forward to starting a small Bible study with three student leaders three days a week and being able to connect with them through that. Brittany has had an awesome time being able to encourage and build up the student leaders that are at Center 1 and being a part of all their impromptu worship sessions and Bible studies. All of her students have started calling her “Sompoa,” which means “beauty” but is meant for someone with really dark skin, so we are a little unclear why they picked that one…. She has also taken to signing herself up to lead everything, such as performing a Khmer pop song at club and lead an all night prayer vigil and plan a “Girls Day” at her center. I have a class of 28 students and love being able to teach them and answer all their questions and try to act out their vocab words and conversations, although with that we spend a good portion of the class just laughing at me. I have also been teaching a woman who teaches at a nearby high school one on one English classes and hanging out with her, once again, earning the right to be heard. It is so much fun, she is hilarious and eager to learn about American culture and English so she can teach it to her 3 year old daughter. We all get the opportunity to join in Bible studies and worship and pray with our different centers every week and have loved being able to share and listen to the perspective of our Cambodian friends on God, life and love. The longer we are here the more we have noticed that God placed each of us in the Center we are in for a reason, and He did a really good job with that too. Lael has been handling the difficulties at her center with grace and patience that Brittany and I have discussed we would not demonstrate. Brittany’s tenacity for trying weird food, such as pig’s blood and lung has won the heart of her students, and I have learned the art of being the perfect target for all jokes and teasing, which has allowed me to settle in well at my center. We have come to enjoy our centers more everyday and love what God is doing in each different place and in our own lives as well. The language barrier is an ever-increasing difficulty that makes for long days, so prayer for better communication would be much appreciated! The cultural differences have gotten us in trouble a few times and we continue to have a hard time knowing exactly what is acceptable behavior, but we are trying. This past weekend we also got to visit Angkor Wat! We were able to travel with a staff member from each of our centers, through 6 hours of gorgeous green countryside on an incredibly bumpy road to the ancient ruins of 1,000 different Buddhist and Hindu temples. It was stunning. The huge temples were tucked away in the lush jungle, surrounded by a moat, with monkeys and elephants all around; it truly was surreal. We feel so blessed that God chose us to go on this adventure with Him and we are excited to see what He has in store for the future. We appreciate your prayers and hope you all are having an awesome summer!!! Sus day! (Hello!) We’re 11 days in, and loving every moment. We’re certainly getting adjusted to some cultural differences. For instance, asking the students out to lunch or coffee turns into a much more complicated experience than you would ever think. They assume we’re just being polite, and also issues of payment make a simple trip more confusing. In general foreigners pay. We’ve learned to be very direct, and state rather than ask, “I want to take you to lunch.” Also, we’ve been informed that most Cambodians don’t talk during meals, but wait till afterwards…this made a lot more sense after several awkwardly silent meals. Also, Cambodians eat rice with every meal (breakfast included), and as Carly has discovered, they LOVE to make fun of you if you don’t like rice. Also, they are CONSTANTLY bringing food back to the centers, mostly fruit…mostly fried. We’ve also noticed a difference in approach to topics of age and weight. People are very blunt in asking about each, especially since the older you are, the more respect you receive…the weight one makes a little less sense, BUT it does exemplify the Cambodians unique ability to laugh at themselves; everything is in fun. No one is mean spirited. Ever. Everyone here is playful and there is an innocence in all of their fun. Also…we’re all swooning to the Cambodian men’s swagger. Their backs lean back, their arms–which despite their heights are ALWAYS lanky…but somehow still attractive–swing freely from their body, and their legs strut forward…kind of bowlegged…but in a good way. In combination with their fitted black pants, silky tight button up shirts, and flip flops…there’s definitely a swagger. Brittany– During the day I stay at Young Life center 1 (our home center), and spend my days hanging out with the students here until 5:30 when I teach English at a VERY beginner level to about 12 students of varying ages (14-22)…this is a very interesting task considering they speak practically no English and I speak practically no Khmer…and God did not gift me with artistic capabilities. You’ll be happy to know that my kids at center one LOVE Taylor Swift. Their English may not be perfect, but they have the words memorized to almost all of T-Swift’s songs…which I plan to implement as a teaching tool in the “Conversation with an American (girl)” class I start teaching on Monday July 4th. The first thing I had my kids teach me in Khmer though, was “I want iced coffee with milk.” I know my priorities. Each day I spend with these kids is more fun and more rewarding than the last, even though the language barrier hasn’t necessarily decreased. I’m still not quite sure what God has in store for me here, but I’m excited to be on this adventure! Lael—Every weekday morning I leave center one by Tuk Tuk (essentially a guy driving a motorcycle with a carriage attached to it). It is great. I love the 15 minute ride to my center everyday. Once arriving at the second center I usually relax and either hang out with the kids at the center or discuss plans with Sophy, the center two director. I have come to be very close with Sophy and his wife Saraw. They actually live at the second center and so every day for lunch I eat with them the meals Saraw prepares—which means eating delicious homemade kmer food. Saraw’s family happens to run a catering company so I am quite fortunate. Saraw agreed to teach me how to cook so every now and then I step in and help her in the kitchen—it is really fun. This week, as soon as I am done recovering from my stomach bug, I will start teaching two different Powerpoint classes in the mornings at the local high school, the first starting at nine am. From there I will head back to center two to hang out with volunteer Young Life leaders and any other kids that might be at the center. I will also start teaching conversation class at 5:30 pm every night as soon as I start feeling better. This will involve me reading various conversations out of a book and helping the kids to use the correct pronunciation and to understand the meaning of the conversation. I am very excited about the relationships I am developing with the volunteer YL leaders at center two. Please pray that I will know how to connect with them as friends and also on a deeper level. Carly-I also get to take a tuk tuk through the crazy traffic every morning, but I’m at Center 3, which is nicknamed the “monkey” center, I guess because they are all a little bit crazy there. I am teased, made fun of, and constantly the victim of some practical joke, usually involving spiders, all in good fun though. At center 3, depending on the morning, I either have a meeting with Sokah (Center 3’s director) and Theary (his side kick) or am doing contact work at a near by high school or helping out in Sokah’s Excel class at the center. Next comes lunch, which usually involves riding on the back on Sokah’s motorcycle to KFC (which they have decided all Americans love) or staying at the center and eating home-cooked Khmer food with some of the student leaders, all of whom I have come to love and look forward to seeing everyday! In the afternoons, starting this week, I will start going to the Muslim district of Cambodia and teaching English to a small group of Muslim teenagers, that we met through doing contact work. After that I will go back to the center and teach a beginners English conversation class. Then I get to hang out with the kids at the center and join one of the student leader’s Bible study. By the time I leave everyday I end up working a 12-hour day, but I love every minute of it! Our prayer requests are for continued patience in language difficulties, our health (all three of us got sick at the same time, nothing serious, but we need to get our strength back), and for us to be good English teachers, but to be cognizant of the fact that that is not our sole purpose here. Chum ree-up sooa From Cambodia! After 20 hours of travel, Team Cambodia arrived safely into Phnom Penh International Airport and was greeted by 15 Young Life kids and the YL director Pyneath. All 19 of us climbed into Pyneath’s truck and headed to the Young Life center where we will be living for most (all?) of our trip. Fun fact, we were so disoriented from traveling that we had to ask what day of the week it was (which in case you’re wondering Seattle, we’re 14 hours ahead of you.) The drive in itself was an adventure. Cambodia is a bustling city in a very hot and humid climate, with people all over the streets. Tuk-tuk’s and motorbikes were weaving in between cars, while monks and street vendors moved along the sidewalks. As we got closer to the Young Life center, the weather changed–and unfortunately for the kids standing in the back of the truck bed–it began dumping sheets of rain. We ran into the Young Life center, and the rest of the high schoolers jumped out yelling “SURPRISE! !” We were then given a tour of the Young Life center, which by the way, is gorgeous. Shortly after settling in, Pyneath and his soon-to-be-expecting wife Christina took us to a local restaurant for lunch. We then got a brief tour of our area of Phnom Penh, and got to drive by the Royal Palace and the Mekong River, and some of the parks where some of our Young Life kids may hang out. Our first morning in Cambodia started with a brief devotional time with some of the Cambodian Young Life staff. It was amazing to worship with them, first singing the songs they knew in English, and then hearing them read, pray, and discuss 1 Timothy Ch. 1 in Khmer, while we followed along in English. 24 hours in, and we’re already amazed with how we see God moving in our lives, the lives of the Young Life staff, and throughout the people of Cambodia. Starting next week we will begin teaching English, basic computer skills, and possibly some bible studies at the 3 Young Life centers in Phnom Penh. Brittany will remain at Young Life center 1, Lael will be at center 2, and Carly at center 3.